on display is about art, the artist, and the artist’s process. In this play, the main character is obsessed with Jackson Pollock and the abstract expressionists. He creates in the action painting style, and to stage the play, it became important to research this process for the actors. To enhance the feeling of an art gallery, we commissioned local artist Joe Holdren to create a series of paintings for the Lyceum Theatre Lobby. He created these works in the abstract expressionist style and inspired by the content of the play and the actors in it. on display is about art, the artist, and the artist’s process. For this production, local artist Joe Holdren was commissioned to produce the paintings we will see being created on stage by the main character, Jack. 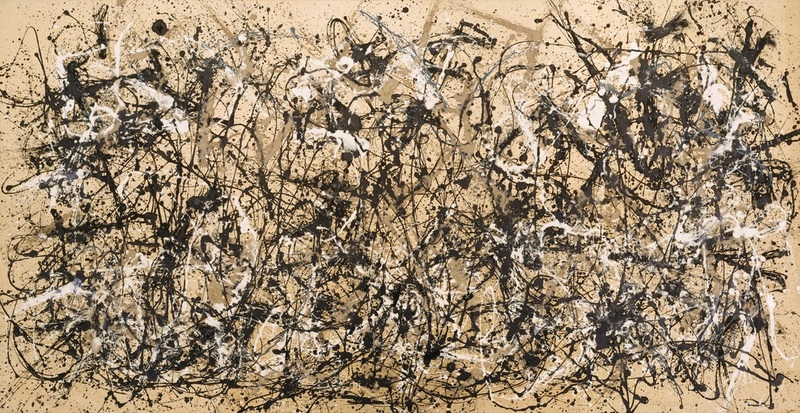 Both Joe and Jack use a painting technique called action painting, a style that rose to prominence with Jackson Pollock and the abstract expressionists in the 1940’s and 50’s. I sat down with Joe in his studio to hear about his work and his process. Daniel Bird Tobin: Why don’t you tell me, in your own words, what you do? Joe Holdren: I make a big ole mess and then I try to organize it all together to present a beautiful piece of work. I try to have fun with my work. That’s the main thing for me. I don’t ever want to get burned out of doing artwork. So it’s a little bit of going back into childhood, and then being able to explore the things that I missed out on. Being able to bring out imagery that I remember, or things that are happening to me today, or things that I wish or desire. All sorts of things pop out. Most of my work has some sort of story even though it’s kind of sporadic. If you’ll stay with it long enough you’ll begin to see things emerge and come out within it. DBT: How did you come to action painting as a process? JH: I guess when I knew I was gonna go to art school, right before I knew I was going to go, I started rolling out my canvases on the back of the driveway. I began getting paints and just having fun and playing. It really was very Jackson Pollock before I even knew who he was. Before I went to art school and learned of action painting. DBT: So what is action painting to you? If you had to describe it to someone who doesn’t know anything about it. JH: For me it’s being able to get into the piece. There’s a degree of erasure and mark making and being able to see the work develop with your whole body. That’s the biggest thing about action painting, using your entire body, the movement of your body. Usually you’re working all the way around the piece. You’re not just looking at it with one dimension. You’re walking around the entire piece. You’re seeing it from all different angles and ways of seeing. I wish I had more space. Space is really tight. That’s the main thing I’m looking for is a studio right now cause I’m going to have to move from here. My dream space would be like this huge warehouse. I could just get a house trailer and put it on the side and that would be my house. My yard would be this big warehouse and I could just paint all over the place. DBT: What’s the most important part of your process? JH: It’s important for me to be within my painting. When I roll it out on the floor, I’m in the painting. I’m working it. I’m leaving traces of Joe in that painting. It’s therapeutic for me. When people do buy my work, I think they are buying a piece of me. It’s not just my work. It’s not something that’s separate. Or a different identity. It is who I am.